Round plastic nursery pots are inexpensive and durable perfect for many types of soil or hydroponic growing media. The raised rim design allows easy handling and easy stack ability when not in use. Can be reused indefinitely. Our nursery pots come with Durable, plastic plant labels/tags ,Easily cleaned with household cleaner for reuse,"UV Resistant" makes the label last as long as possible ,These plastic plant tags are waterproof and will not brittle and snap like most plastic tags. Inexpensive and durable thin plastic material which made it soft and light weight,reusable. Come with a big bonus: 100PCS Plastic Waterproof Plant Nursery Garden Labels Tags Markers, Reusable and easy to clean. 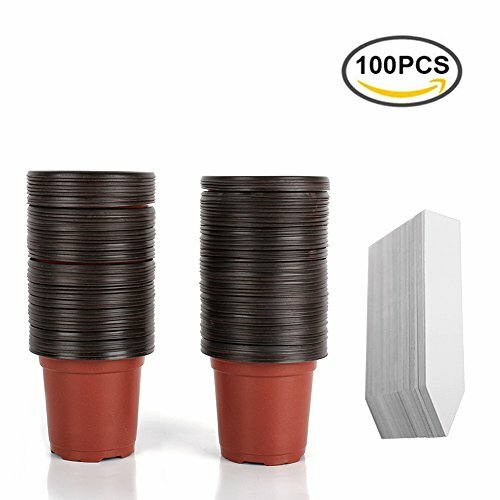 The nursery pots can be used with various types of soil or hydroponic growing media. The pot has 8 small drain holes design in the bottom can help soil drained and ventilated, and the top raised rim design allows easy handling and easy stack ability. 4" Inch Plastic Pots, 2.75" Inch Height /Dimensions for Label:0.8" x 3.9" Inch. If you have any questions about this product by LALIFIT, contact us by completing and submitting the form below. If you are looking for a specif part number, please include it with your message.